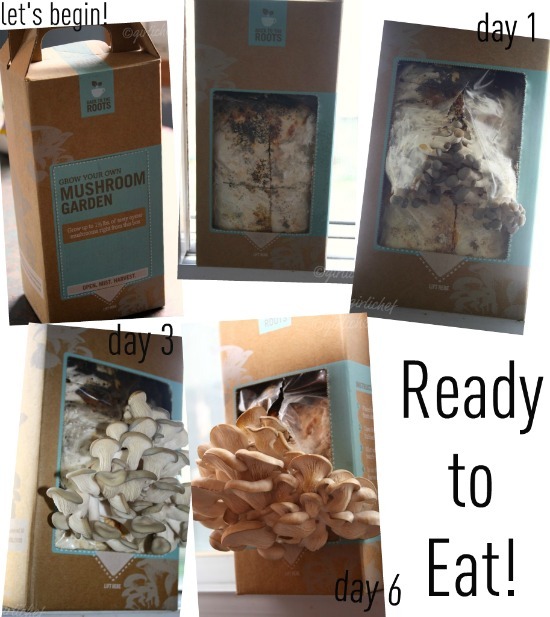 product review: Back to the Roots: Grow Your Own Mushroom Garden + a giveaway! Guess what? It really works! The kids and I had a great time watching our mushrooms grow from our Grow-It-At-Home Mushroom Garden from Back to the Roots. It's as simple as cutting a couple of slits and spritzing with water two times a day. You also need a window sill. My one issue is that I don't have big window sills...which makes both me and kitty sad. So. When the weather outside became scorching, I had to close the windows so that I could turn on the air. This in turn stopped air flow to my mushrooms and halted their growth. Live and learn, though. They grow beautifully and magically as long as you have a window sill and an open window in which to let them sit for ~10 days. I made it through six days, however and still had a beautiful (if smaller than they would have been) batch of mushrooms to use. Fortunately, you can turn the box around and use the other side, so we currently have more growing for use in a few days. Plus, Back to the Roots sells placement bags, so once you've grown mushrooms from both sides of yours, you can order more! Back to the Roots is currently on track to divert and reuse 1 million pounds of coffee ground this year alone. Plus, they donate their premium soil amendment to 10 different urban school and community gardens. One of my favorite things about BTTR is that if you grow your own kit and then post a picture of it on the Back to the Roots Facebook page, they will donate a kit to the elementary school of your choice! How much fun would it be for one of you children's classrooms to watch these mushrooms grow! We do science projects for school every year, and my kids have already said that they want to grow mushrooms (again) towards the end of the next school year to show-off as their projects. Plus, if you've ever had a garden, you know that letting the kids "get their hands dirty" totally makes them want to eat things they may not have eaten otherwise. 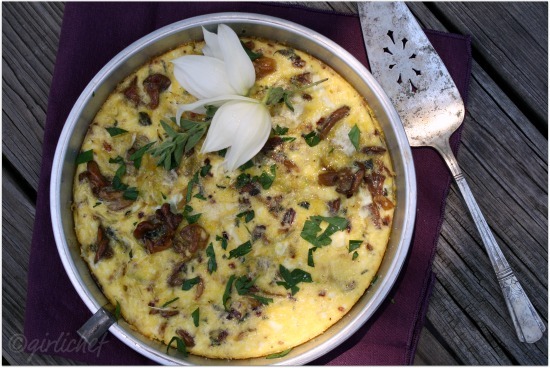 This is what we made with our first crop of oyster mushrooms: Yucca Flower, Mushroom, & Feta Frittata. So, what do ya say? Would you like the chance to grow your own oyster mushrooms at home? Well, the awesome guys at Back to the Roots have generously offered to send one of my readers a kit of their own. Yay! Must have a mailing address in the USA to win. Please leave a comment letting me know you'd like to win a Grow Your Own Mushroom Kit. Please make sure your comment either links back to your blog profile or email address so that I can contact you if you win (or leave email in comments). All submissions due July 23, 2011 at 11:59 pm (Eastern). Good luck! Connect with Back to the Roots on Twitter, too. *I was sent one free GYO Mushroom Garden Kit from Back to the Roots to test and review. I was compensated in no other way. All opinions stated in this post are 100% mine. This is pretty awesome. Don't enter me in this give away but it really is a lovely opportunity for someone to grow their own exotic mushrooms!Your frittata looks absolutely delicious! I love this mushroom kit. Pity it isn't available in the UK. I would buy one straight away. I want to be entered in your contest. I'm at www.lifeinthemicro.blogspot.com. This product would be the perfect Camp Momma Summer 2011 project. I've not tried growing mushrooms before. I wonder if I can put them outside on my screen porch as we are heavily airconditioned inside the house now. My oldest loves mushrooms and my littlest is quite the gardener. I love that he is using old coffee grounds. Heather, this is way too cool! My Mother lives in Massachusetts so has a US mailing address, but I'm not sure if that counts since I live in Canada and I don't, lol. If I don't qualify, feel free to delete this comment, I understand. :o) This looks like so much fun! I'm fascinated. Add mushrooms to the list of stuff I want to try growing. I would love to have this kit! I would love to win and how cool that my daughter's school could also grow 'shrooms!! I want I want I want to win! This is amazing! I'd love to win this! Thanks for the opportunity. This looks fantastic, I would love to win this! The mushroom kit looks so interesting and looks like lots of fun! That recipe looks so delicious!! I'm going to check them out (even though I do not have a window sill and it is 94 degrees so the blessed a.c. is on). I wonder how it would be outside in the shade where the inedible mushrooms grow? Grand frittata. Heather! That is so cool! Larry (Big Dude's Eclectic Ramblings) grew his own last year but ordered a kit, had to drill holes in a log, and all kinds of stuff. This seems way easier. I would like to grow my own mushrooms one day soon! It's cheaper to grown your own food. Thank you for offering this great giveaway. great giveaway!too bad I can't join.. Awesome! I would totally love to give the mushroom kit a try. AND -- great to know they donate soil amendments to school/community gardens. I live in the Bay Area and work with a school garden, maybe they can hook us up! I would love to give this a try, what fun!!! This sounds awesome! I would love the chance to win. I would absolutely love to grow myself some mushrooms! I can't believe how fast they grew! I've been hearing a lot about this product lately. I think it's brilliant. I have researched the company a bit. I think we can all get behind something that's innovative and good for our earth and our bellies! Oh how I'd love to win one of these! Thanks for the opportunity. Of to follow Back to the Roots on Twitter. Wild! I wonder if they have mushroom logs in Canada. So cool! I am trying to live more sustainably by growing my own fruits and veggies. Mushroom growing would be a great addition to my project! How fun is that?! So much better than a Chia Pet! ;-) I love how easy it is. There is nothing better than fresh mushrooms. This is so much fun! We got these kits at Camp Blogaway, and several of us just left them be, forgot about them, until they surprised us on the same day! We all Tweeted the photos and laughed! My kids enjoyed watching them grow, just like yours! Fun, fun, fun project! Okay, this product looks SO GREAT! A.) I like to cook with mushrooms. My picky eater only eats tomatoes and now mushrooms! Growing our own will be healthier as I know where they are coming from, it will be a great growing experience for my child, and it sounds like fun! Bet they will taste better too! I would love to win this kit! What a great idea this company has! Oh...I LOVE fresh oyster mushrooms! Our "Thanksgiving" gravy was made with fresh oyster mushrooms...a real treat.